Trump and Cruz join forces for anti-Iran rally. 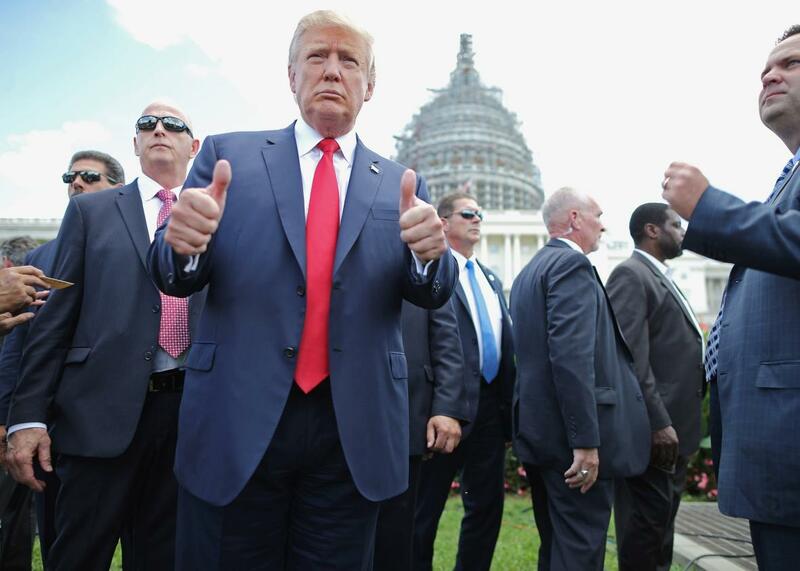 Republican presidential candidate Donald Trump gives the thumbs up to photographers during a rally against the Iran nuclear deal on the West Lawn of the U.S. Capitol on Sept. 9, 2015, in Washington, D.C.
GOP front-runner Donald Trump and somewhat underperforming Tea Party standard-bearer Ted Cruz appeared back to back Wednesday at a rally on the West Lawn of the Capitol against the nuclear agreement with Iran, which now appears almost guaranteed to stand. The rally, organized by Tea Party Patriots, the Zionist Organization of America, and the Center for Security Policy, featured speakers ranging in expertise, from Sarah Palin to former CIA Director James Woolsey to Duck Dynasty’s Phil Robertson. Former Virginia governor and way-long-shot presidential candidate Jim Gilmore was also there. (I overheard at least one spectator asking who he was.) But Trump and Cruz were the main draw. Imagining life under President-elect Trump, the Donald also stated, “I guarantee you that those four prisoners [the four Americans currently in Iranian custody] are back in our country before I ever take office. They will be back before I ever take office because [Iran’s leaders] know that’s what has to happen.” This was likely a reference to Iran’s release of American hostages on the day Ronald Reagan took office, an event frequently, if misleadingly, invoked by Republicans to demonstrate the importance of credibility in foreign policy. Moving quickly to other topics, Trump promised the enthusiastic crowd, “we will have so much winning if I get elected, that you may get bored with winning.” The crowd seemed to be eating it up. Cruz’s attack was more detailed. Repeating one of his favorite talking points, he said that the deal would make Barack Obama “quite literally the world’s leading financier of radical Islamic terrorism.” He invoked the specter of Iran using a nuclear weapon in an electromagnetic pulse attack, also a favorite hobbyhorse of rally organizer and fellow speaker Frank Gaffney of the Center for Security Policy. Along with several other speakers, Cruz noted that the deal will lift some sanctions on Quds force commander Qassem Suleimani, who has been accused of supplying weapons used to kill American troops in Iraq. “How do you look a mom in the eyes and say I voted to lift sanctions on the man who murdered your sons when they were defending this nation?” he asked of the members of Congress currently considering the deal. (The discussion of Suleimani may have been a little awkward for Trump, who was stumped on a question about the Iranian general in a recent interview with radio host Hugh Hewitt.) “We know to an absolute certainty that people will die” if the deal goes through, Cruz said. Cruz put much of the blame on Republican leaders in Congress for allowing the vote to go forward, arguing that the congressional review period for the bill shouldn’t actually begin until the White House presents the secret “side agreements” between Iran and the IAEA to Congress. (Several signs in the crowd accused Mitch McConnell and John Boehner of being traitors.) But he also acknowledged, correctly, that the best chance Republicans have of scrapping the deal is winning the White House next year. There’s still some fairly low-stakes procedural wrangling to be done over the next few days, but if there was any doubt, today’s rally made clear that the main action over the Iran deal has now moved from Congress to the campaign trail, which was probably inevitable all along.